After Islamic Republic's Minister of Culture and Islamic Guidance told Aljazeera English that he wants "Facebook for everyone", I thought it might be revealing to tell the story of Azamolsadat Hosseini, the female spokesperson for the municipality of Behshahr, who was sacked from her position last Wednesday; for having a facebook account. 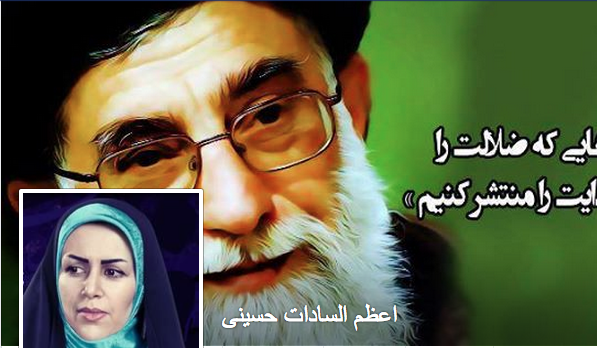 As you can see from the screenshot of her Facebook page here, she is in no way an opposition figure. Even after her sacking, she expressed total obedience to the Supreme Leader by saying with over the top adulation that what the Supreme Leader says in Iran is the final word as far as she is concerned. What she posted on her facebook account was no more than messages related to religious occasions or how her day went during a typical working day at the municipality, much similar to what Islamic Republic's foreign minister, Javad Zarif, posts on his facebook. Of course there is an important difference, which allows Zarif to have a facebook account in the Islamic Republic but rebukes the spokesperson of Behshahr in North Iran for having a facebook account. Zarif's facebook is useful for manipulating the international public opinion and for portraying a lustrous shop front window for the outside world. This is not the case for ordinary Iranian citizens and that is why they have to use anti-filters to circumvent the internet censorship that restricts them to facebook, other social media and many other informative websites. Even if the Regime suddenly said Facebook is now open to all in Iran, such a sanction would merely mean that their Cyber Gestapo was now fully on line to use it as a spying weapon. I have a question have you ever bean in behshahr, do you know Azam? have you ever talk to her? I am from behshahr and I know her, she had some problem but it was not because of her page in facebook, and I can say that almost all thing you said is crab, you just write what think about iranians or you want world think about iran and iranians.